With several different groups (districts, states, publishers, etc.) 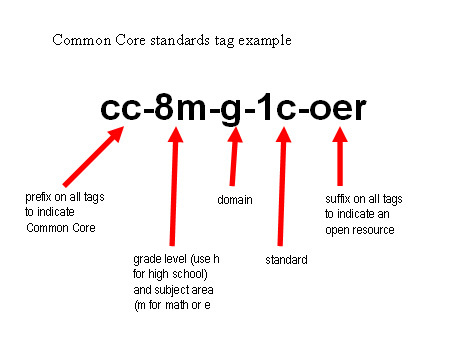 working on tagging content assets — especially open ones — for the new Common Core standards, a group of us thought it might be useful to have a standard (no pun intended) tagging schema. I don’t know much about what makes a “good tag,” but not being one to let ignorance stand in my way, I’d like to throw out a tag format to get input. One question I have is with regard to the suffix. My thought was that it would be nice to be able to search a repository and find all the content for standard G-1c that is open. However, another alternative would be to omit the -oer suffix or have a separate oer tag and then search on the combination. I guess you could also tag both with and without the tag (e.g. both cc-8m-g-1c-oer and cc-8m-g-1c). What other ideas, thoughts, comments, etc. do you all have? The tags make sense. Like you, I’m not sure about the oer suffix. I’d probably choose OER as a separate tag. The most important thing is that a tagging system be established. Also, it would be vital to establish as consistent system, unlike New York State. While it had a tagging system, their publications varied in format. For example, one publication might label a standard 5n3, while another would label it 5.N.3, yet another 5.N.03 and 5.N03. Such inconsistency makes searching more complicated than it need be. Thanks for the feedback and especially the support for establishing something like this. There are indeed several flavors of OER. One simple way I’ve seen folks handle this is with options for “remix and share,” “remix and sharealike,” “share only.” This covers customer (non-CC) licenses and seems to use fairly commonly understood terms.